You can design your own custom room to the size and shape you want. You aren't restricted to standard sizes or kit form rooms, but truly a beautiful room to match your home and needs. At Sunroom Living, our goal is to not only help you design and build your sunroom, but to make the process easy and enjoyable for you. 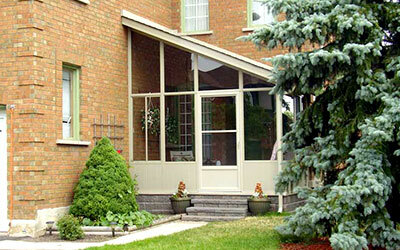 We install sunrooms manufactured by Lifestyle Sunrooms of Peterbrough, Ontario. You are able to design your own custom room to the size and shape you wish. You are not restricted to standard sizes or kit form rooms, but truly a beautiful room to match your home and needs. We are a full-service design/build company with a wide range of experience. We will care for all phases of construction from obtaining the building permits to final details you wish us to care for. Our excellent reputation and long list of satisfied clients attest to our superior craftsmanship, attention to detail, clear communication, honesty and integrity. Just ask for our client reference list. Your complete satisfaction is our guarantee. Design your own custom room to the size and shape you wish! 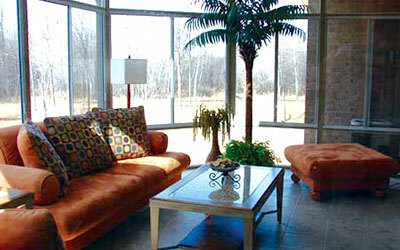 We have a reference list of over 120 homeowners who would be happy to let you know how much they enjoy their sunroom. 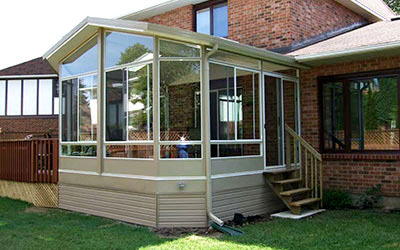 Upon request, we can provide you a list of sunrooms in your area and arrangements can be made for you to view them. 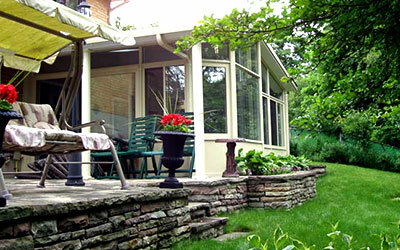 We have built beautiful sunrooms for our happy customers. The level of service at Sunroom Living is fantastic. Having enjoyed my sunroom for many years, I am consistently impressed by the professionalism of every staff member I have come in contact with. Thank you! In this day and age, it’s hard to find a company you can trust. Sunroom Living was recommended to me by a friend, and now I know why – the quality of service I received was outstanding. Keep up the good work! We love our sunroom and enjoy it all year long, thanks once again Dan. And if anyone wish’s to stop by and see it or call us regarding our comments on our room they are more then welcome to visit or ask us questions. My wife and I enjoy our warm, bright spacious addition. The cathedral ceiling with a remote ceiling fan and light creates a refreshing, socializing atmosphere in all seasons. The high quality, certified Canadian windows provides excellent visibility, with minimal heat loss or condensation issues. The exterior design provides minimal snow or rain hindrances. Certified City of Ottawa inspection was flawless. I had owned a ‘glass top’ solarium; the functionality and quality of this sunroom is far superior plus an excellent property investment. The overall installation and minor service, ie- adjust a door latch was prompt, and was neat and professional. Thanks again Dan for the GREAT job you did on our sunroom. We are enjoying it very much. We love to show off our sunroom during the summer as well enjoying it just as much in the winter. Our sunroom is a wonderful addition to our home. I love it! It is very peaceful and relaxing. I sit out there and feel like I am outside but without the bugs. It is nice to have a quiet place to relax and read in the mornings. I am thoroughly enjoying my sunroom. Thanks for the great job Dan. © 2016 Sunroom LIving. All rights reserved.